The SensorCore(SC or SCA) is designed as a low-cost, low-power data logger for the most demanding analog data-acquisition applications. Featuring up to 48 channels of ADC inputs, 2 RS232/RS485 ports, CompactFlash interface, and a high performance 10/100M BaseT Ethernet. 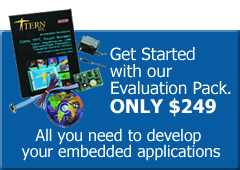 The SensorCore out-performs desktop-based acquisition solutions for a fraction of the price. Measuring only 2×4.5 inches, the SC and SCA has the same unique profile allows it to be installed into difficult-to-access physical locations, like pipes. Even with this limited real estate, the SC is a full-featured, stand-alone industrial embedded controller. The SC is based on a high-performance C/C++ programmable x186 CPU. It integrates 3 timer/counters, 2 serial ports, external interrupts, PIOs, and a real-time clock. 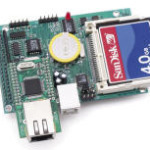 The board is available with up to 512 KB of battery-backed SRAM, 512KB Flash, and 512 bytes EEPROM for non-volatile parameter storage. The board runs on approximately 150mA at regulated 5V, and can be powered through onboard linear regulator accepting 9-12V DC. An optional low-drop regulator (TPS765) can be installed to provide Power-off feature allowing low voltage(5.1V) battery operation. Optional 2 channels 12-bit DAC analog outputs can also be installed. The SC has two RS232 serial ports as default, and one can be configured as RS485 operation. The SC also features an integrated high-performance 10/100-baseT hardware TCP/IP module, which allows 100KB+ access to TCP/IP networks with minimal CPU load. Sample implementations for the SensorCore allows it to be configured as a HTTP web-server, FTP server/client, etc. The SCA can install 6 ADS7852 chips to provide a total of 48 analog inputs, while the SC can install 3 LTC2448 chips to provide 48 analog inputs. The SC features three high-speed LTC2448 sigma-delta ADCs. Each LTC2448 chip offers 8 ch. differential or 16 ch. single-ended input channels (up to 48 channels if all 3 chips are installed). Variable speed/resolution settings can be configured. A peak single-channel output rate of 5 KHz can be achieved. At a sample rate of 1.76KHz, readings are accurate at up to 18+ bits in basic experimental conditions. The LTC2448 works well directly with strain gages, current shunts, RTDs, resistive sensors, and 4-20mA current loop sensors. The SC can also work well directly with thermocouples in the differential mode. With a Type T thermocouple, we can have 200+ ADC counts per degree C. There are 8+ million counts of resolution in the input span. If desired, you could put a divider at the input to increase the input range. The SCA can have up to 6 high-speed 12-bit parallel ADC chips (AD7852) installed, each chip providing 8 channels analog inputs, with up to 300K samples per second. The AD7852 includes sample-and-hold, a precision internal reference, and has an input range of 0-5 V.